"Can somebody tell me what kind of a world we live in where a man dressed up as a bat gets all of my press?! This town needs an enema!" Good news, Batman fans! The original Tim Burton Batman series is returning to theaters this May. Fathom Events has announced a celebration of the 30th Anniversary of Burton's Batman, first released in 1989. They'll be showing the four Batman movies from that series in theaters, one night only (each one), if you want to watch them on the big screen again. This compliments the recent 70mm screenings of Christopher Nolan's The Dark Knight trilogy, which was to celebrate the 80th anniversary of the creation of the DC character (by artist Bob Kane & writer Bill Finger). Book your tickets. "For four days in May, four Batman movie adventures will return to the big screen, each for one day only, beginning with Tim Burton's groundbreaking 1989 Batman." They're showing the original Batman (1989), directed by Tim Burton, in theaters on Saturday, May 4th. Following that opening event, they're showing Batman Returns (1992), again directed by Tim Burton, in theaters on Monday, May 6th. And oh yes, they're continuing on and showing Batman Forever (1995), directed by Joel Schumacher, in theaters on Sunday, May 12th. And finally (surprise), they're also showing the disastrous Batman & Robin (1997), again directed by Joel Schumacher, in theaters on Tuesday, May 14th. For more info on the event, to get tickets, and to find out which cinemas are hosting these four anniversary screenings - visit Fathom Events. From Fathom: "Celebrate Batman's 80th Anniversary with a special big screen event featuring 1989's classic Batman! Michael Keaton is the Caped Crusader, who fought through a childhood trauma to become a masked crime fighter. Jack Nicholson is the Joker, who emerged from a horrible accident as a maniacal criminal. Don't miss this classic in theatres for an exclusive one-night event!" Next up after this one is its highly acclaimed sequel: "An 80th Anniversary celebration of Batman brings back Michael Keaton returning as the legendary hero who battles against the mysterious Catwoman (Michelle Pfeiffer) and the diabolical Penguin (Danny DeVito) - who has a plan to destroy Gotham City and the Batman. Fans won't want to miss this classic Batman tale on the big screen!" And another introduction: "The Batman 80th Anniversary celebration brings the next installment in the Batman Films. Val Kilmer is the Dark Knight, and Chris O'Donnell is his trusted new partner Robin. Together they face off against legendary super-villains, the Riddler (Jim Carrey) and Two-Face (Tommy Lee Jones). Join in on the 80th anniversary festivities on the big screen with this classic superhero action!" And honestly, does anyone even care about Batman & Robin? 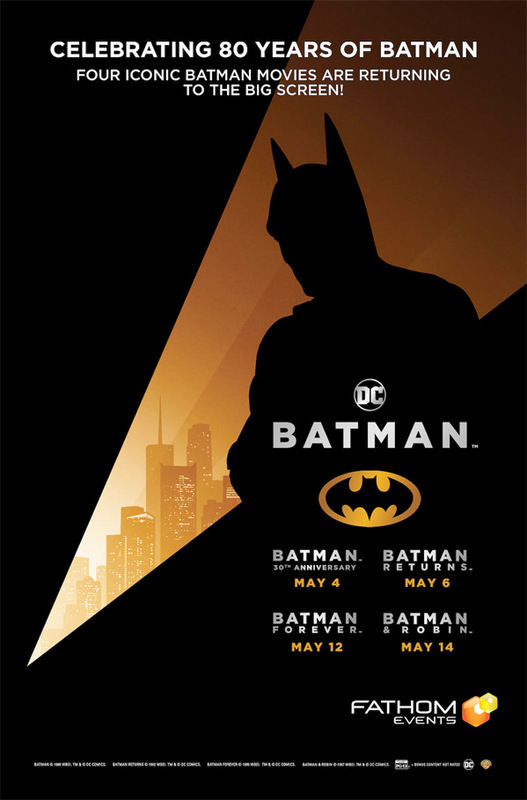 They've also released a promotional poster (seen below) for the Batman events, and some promo material via their Twitter @fathomevents. I'm sure most fans agree that the first two Burton Batman movies stand on their own, separate from the others, but they're all from a bygone era, and Nolan's trilogy overshadows them now. But they're awesome in their own ways and worth seeing on a big screen. Have fun at the cinema.